What you see in photos and Google Earth image above is Galešnjak, a very small (about 500 metres wide) islet in Croatia, which looks likes Valentine's Heart. It is uninhabited and till recently was unknown. Suddenly the owner of this islet started receiving requests from people seeking permission to stay there. 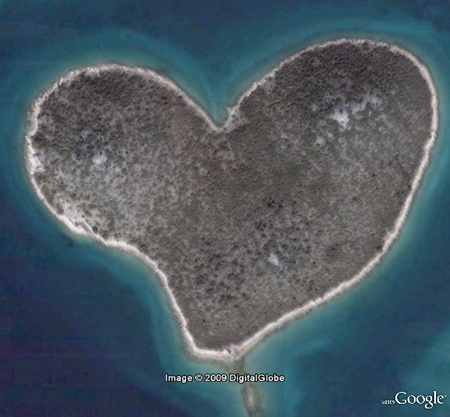 It seems some lovers saw it on Google Earth and fascinated by its shape spread the word around and now it is known as Lover’s Island. This post is dedicated to all the persons who love and care for some one. Be it lovers, or married couples or friends or siblings or children and their parents or children and their grand parents etc. etc. oh gosh! the heart is so nice!!!! But still, I think we should preserve this piece of natural island for human activity may make it into an unpleasant place to be since there are a lot of inconsiderate people around. Although some good people may not be, but we cannot risk losing such a piece of natural beauty. Of course, there are exceptions everywhere and on both sides of the littering coin, but THE MOST PART, Western, Southern & Northern Europe are more considerate than we are. Take Sweden for example: you can pretty much pitch your tent where you please, as "federal" (OUR term) land belongs to the people, not its governing body. Said people leave no trace of their passing; all trash is taken with them when they leave, without having to put up the countless signs we have here asking us to do so. (They have SOME, but much fewer, & they are aimed at tourists.) To drive the point further, a few years ago, there was a mini scandal as some American tourists complained that when they announced to car rentals that they were going to drive north through the countryside and camp, they were given flyers about not littering and tourists from other places weren't. In fact, it was found that included on the potential "litterers club" and also targeted and handed the aforementioned flyer, were tourists from Central & South-America, the U.K., and most countries comprising the new Federation of Russia... I wonder what the actual facts that spurned this particular belief system are.